A'kin Lavender and Geranium Body Moist is formulated with active plant oils and extracts that combine to deeply hydrate and soften the skin. It is a concentrated source of omega fatty acids and nurturing flower extracts that leave your skin glowing and replenished. 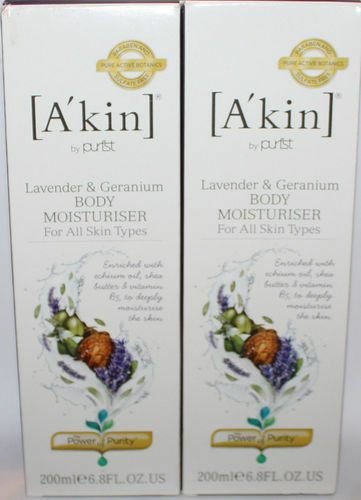 Benefits of A'kin Lavender and Geranium Body Moist: Ideal for daily moisturising. Contains active certified organic soothing lavender oil, macadamia oil and avocado extracts. Rich in vitamins and omega 3, 6 and 9 essential fatty acids to give skin intense moisture. Suitable for all skin types, including dry.